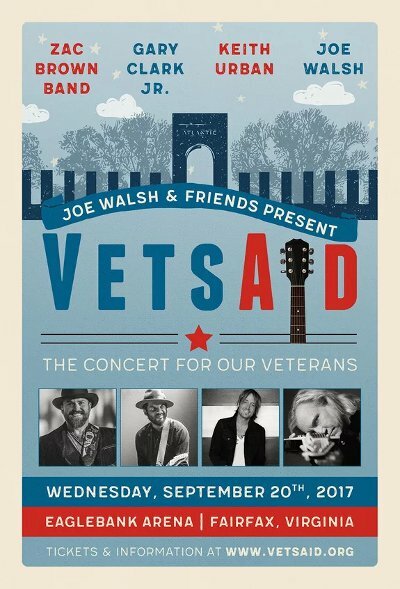 Joe Walsh has announced the very first VetsAid concert, to be held at EagleBank Arena in Fairfax, VA on September 30. Joining Walsh will be country superstars Keith Urban and the Zac Brown Band and Americana and blues great Gary Clark, Jr.
War is hell for everyone involved. I lost my father when I was a baby, before I could even make a memory of him. I stopped counting the number of friends I lost in the Vietnam War or that came home forever scarred mentally or physically or both. We’ve only just begun to appreciate the long-term impacts on our troops home from Iraq. And in Afghanistan, the longest war in American history continues to drag on with no end in sight and just last month this administration committed to send thousands more of our young men and women into the conflict with no defined goal or strategy. I had to do something and seeing as though rock-and-roll seems to be what I do best it’s also the least I could do for those who have served and continue to serve our country. We’re all in this together as Americans and seems to me lately that people are forgetting that. I asked my buddies Zac, Gary and Keith to step up and I’m so grateful that they did. Let’s put on a show, raise some money and celebrate our vets… and let’s do it every year! Tickets go on sale to fan club members tomorrow (July 18) at 10 AM with general sales starting on Friday, July 21 at 10 AM.